Our school offers piano lessons for students of all ages and abilities from beginners to very advanced. We offer every style of piano lessons from classical to jazz and pop. We have students who want to play just for fun as well as students who enter competitions and go on to collegiate music programs. Since we have so many piano teachers on staff we are able to match students with an instructor who works best for their particular age, ability and interests. We start piano lessons for students age 5 and older. (Note: 4 year old students may be enrolled in our Suzuki method private piano lessons. Space in this program is limited. See below for details.). Our piano lessons are offered in both private and group formats (see Group Lessons). 30 minute weekly lessons are recommended for most beginning students, though many of our adult students prefer to take 45 or 60 minute lessons. Longer lessons are also available for students who are advancing and would benefit from more time with their teacher each week. Parents are always more than welcome to sit in on their child’s lessons. For our advanced students we have teachers with master’s degrees in piano who can prepare them for university entrance and competitions. Contact Us Now for More Information. 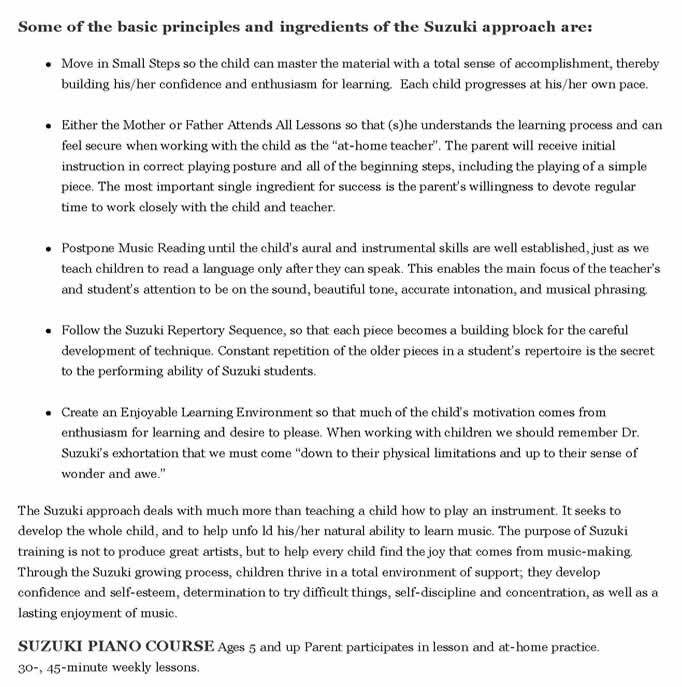 The highly regarded Suzuki method of instruction is particularly suitable for the very young child and it emphasizes the parent’s role in supporting the students’ learning. No previous experience is necessary for the parent. “The mind has the ability to begin learning anything at a young age. The younger one starts, the earlier the mind is capable of learning quickly.” - Dr. Shinichi Suzuki. The Suzuki Method is learning through hearing. By listening to recordings of music and repeating those passages on their instrument, the student learns each piece. Once the child learns a certain passage, they progress to the next step, where the “listen -play, listen - play” process is repeated. Suzuki training is partly parent training. The Suzuki parent becomes the child’s at-home teacher. Six days a week, the parent teaches the child at home. On the seventh day, parent and child come to the teacher for a lesson, and for direction on how to begin the next week’s work at home. The parent and teacher together guide the child’s progress. Through their concerted efforts the child’s success will be realized. Note: Space is limited for this program.Contact Us Now for More Information. Students age 6 years and older may sign up for this lesson format where non-strenuous, age appropriate singing is explored in combination with basic keyboard skills, note reading and other musical concepts. As with all lesson types offered at the Music Learning Center, a free introductory lesson may be taken so that the parent and child can learn more about what is covered in Singing – Piano lessons. Contact Us Now for More Information. Our private guitar lessons include acoustic, electric and bass guitar. We have an excellent and varied guitar teaching staff who can teach everything from rock to jazz, classical to pop, and Spanish to folk. Our teachers are all very active performing themselves as soloists and in bands. Each guitar teacher has a college or university music degree and is well versed in the proper theory and technique a student needs, no matter whether they are interested in classical or heavy metal. Guitar lessons at our school are enhanced by the opportunity of learning how to play with other musicians in rock or jazz bands, or as a soloist in one of our recitals. No matter what type of guitar lessons you are interested in, we have the teachers to help you. Students may begin guitar lessons at the Music Learning Center at age 5 or older. Younger students will need a smaller size guitar; our instructors are available to help you choose the proper instrument for your child to start on.Contact Us Now for More Information. We offer a wide variety of drum and percussion lessons. Most of our students learn on a drum kit. Drum and percussion students can begin lessons at age eight or older; however, after a consultation with one of our teachers, several have successfully begun as young as 6 years old. Drum lessons are taught on a drum kit in our studios, but students are able to get started practicing at home on practice pads before purchasing or renting a drum kit. Our drums lessons stress proper technique so that students become good drummers quickly. 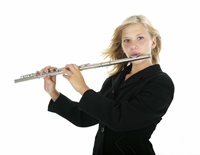 Recordings are often used for students to play along with in lessons and in some cases at recitals. Our instructors are experienced at teaching a very wide range of musical styles. We also have percussion students who choose to focus on things like snare drum for school bands, hand percussion, or marimba and vibraphone. Contact Us Now for More Information. Our strings program offers private instruction in violin, viola or cello. Our private string instrument lessons start with students as young as age 5 and we have many adult students as well. For younger children the parent may want to sit in on the lesson to help the student at home with things such as posture and hand positioning. Our teacher will instruct the parent about what kind of assistance to offer the student at home. Our violin, viola and cello teachers have university or college degrees in their instrument and perform regularly with local orchestras and ensembles.Contact Us Now for More Information. Our private saxophone and clarinet lessons are offered to students age 10 and older. After a consultation with one of our instructors some students have begun at ages 8-9. One determining factor is whether the student has developed the lung capacity and strength to handle these instruments. Our saxophone and clarinet instructors are proficient on both instruments so a student can start with clarinet lessons if they wish and switch to saxophone lessons without having to change instructors. Our saxophone and clarinet instructors actively perform in all types of bands and ensembles and as soloists. Saxophone, clarinet and flute lessons are offered in 30 minute, 45 minute and 1 hour lengths. Many of our adult students have fulfilled their life-long dream to take up one of these instruments. Students are introduced to a wide range of musical styles and also given the opportunity to join either our band ensemble or flute choir. Contact Us Now for More Information. Our brass lessons include private trumpet lessons, french horn lessons, trombone lessons and tuba lessons. Students for these instruments usually are ages 9 or older as they need to have developed sufficient lung capacity. Our brass teachers have university or college degrees in music and are active performers in a variety of settings. We can help students enhance their instrumental skills for greater success in their school band program, or to help develop advanced skills as a soloist.Contact Us Now for More Information.